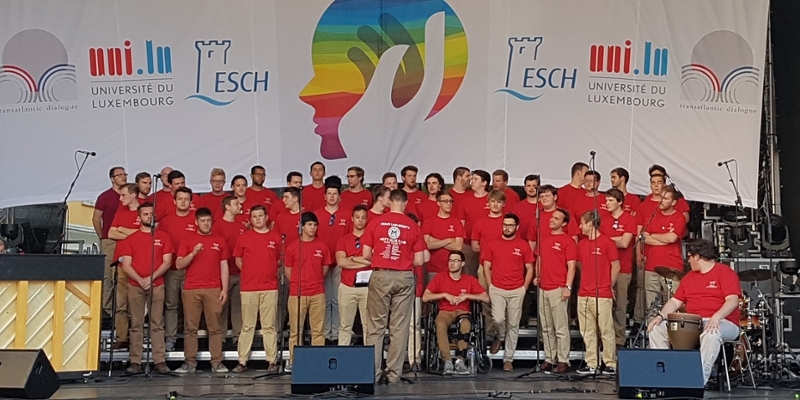 Members of the Miami University Men's Glee Club traveled on a European concert tour May 15-31, 2017. The group of 48 traveled to Germany, Czech Republic, Austria, France, and Luxembourg. For the first time, the group offered a parallel tour to include Miami alumni, family, and friends to experience traveling alongside the Glee Club. Concert highlights included: Thomaskirche (Leipzig), Heilig Kreuz Passion (Berlin), Nicolas Church (Prague), Evangelischen Christuskirche (Salzburg) a friendship concert with a local choir - Chorvereinigung Salzburg-Aigen, Trans-Atlantic Dialogue Conference Outdoor Festival (Esch sur Alzette, Luxembourg), Memorial Day Observance Ceremony (Luxembourg American Cemetery), Bitburg Military High School (Germany), St. Augustine Church (Wiesbaden, Germany) – a concert with Miami University alumna, Janice Creswell Doemland '94. Dean Thierry Leterre hosted the Glee Club, alumni, and other guests for a reception at the Chateau, celebrating the 20th Anniversary of MUDEC's presence in Differdange. President Greg Crawford and Miami Ambassador Dr. Renata Crawford were present for this event, as well as at the Memorial Day Observance Ceremony earlier that day (Sat, May 26), where they laid a wreath on behalf of Miami honoring our fallen soldiers. Following the Glee Club's singing at the MUDEC reception, President Crawford presented Men's Glee Club conductor, Jeremy D. Jones with the President's Medallion for making significant contributions to the university and exemplifying the university motto. Highlights of historical sites visited included: the picturesque city of Eisenach to visit the Wartburg Castle; J.S. Bach and Felix Mendelssohn Museums (Leipzig); Soviet War Memorial (Berlin), German Cemetery (Lux), and the Luxembourg-American Cemetery (Lux); Theresienstadt (Terezin, Czech Republic); Prague Castle; Mozart's Birthplace Museum; the quaint medieval town Rothenburg ob der Tauber; Strasbourg Cathedral (France); and an afternoon cruising the Rhine River.